This book made me laugh! A lot! 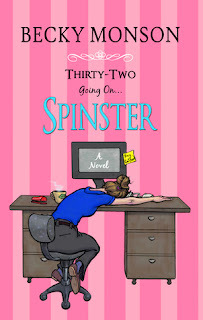 Thirty-Two Going on Spinster is a fun, easy read full of laughs, heart and hope. Anyone stuck in a rut or approaching an age where love is beginning to seem impossible will enjoy this tale. Julia is stuck. She’s living in her parent’s basement, working at a job she loathes, and has no man in sight. She fears she’ll become a crazy old spinster with a thousand cats when an attractive new employee, Jared, starts working for her firm and slowly - oh so slowly - things start to change. I loved Julia's progression over course of the novel and thought it was handled really well. She's smart and funny and very relatable and I really enjoyed reading her story, even though her antics made me cringe from time to time. We’re given a detailed look into her job, which Julia not only finds boring and uninteresting, but is one she loathes. She feels greatly under-appreciated as many of us do, and Monson paints an accurate picture of her issues at work so it’s easy to see why she hates it. We also see her life at home, which is boring and uninteresting – and oftentimes, hilarious. Watching Julie flounder, it’s easy to root for her to change her life. It also helps immensely that she’s so funny and self-deprecating at times. I loved her best bud at work, Brown, whose gossip sessions were always amusing. The love interest, Jared, was great, and the way she meets him for the first time is absolutely hilarious. It might win the best first meeting ever. In fact, all of the characters in this cute novel are fabulous. 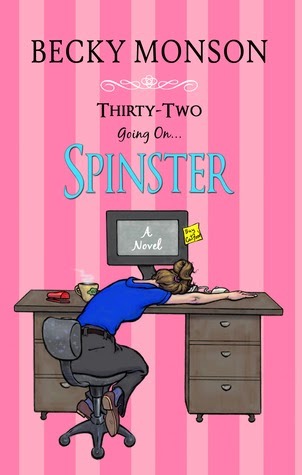 There was a little repetition, particularly the term spinster and the cat references, but I’m particularly sensitive to this because I read so quickly. Overall, I loved this book. It's fast paced, and although somewhat predictable, the journey is still enjoyable. Anyone stuck in a rut or anyone that worries about the future will love this one. I look forward to more from Becky Monson! Thank you to Becky Monson for our review copy. All opinions are our own.